Featuring 220 cards. Shop for base sets. Featruing 20 cards. See them all with this visual guide. Featuring 57 cards. Full guide here. 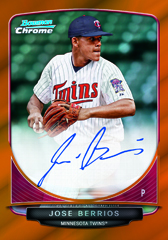 2013 Bowman Chrome Baseball uses a formula that has worked for years. Take the latest rookies, a generous dose of prospects, lots of color, and top it off with autographs. While the overall feel may lean towards continuity, the set has some new inserts and different spins. 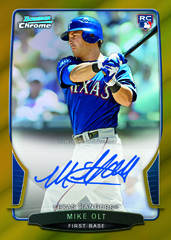 Every 2013 Bowman Chrome Baseball hobby box comes with the standard one autograph. Adding a little unpredictability is the addition of a second signature in every third box. Most of these fall under the Chrome Prospect Autograph and Chrome Rookie Autograph banners. Both have several Refractor parallels: Blue (#/150), Gold (#/50), Orange (#/25), Purple (#/10), Red (#/5), and Superfractor (1/1), as well as Printing Plates. Prospect Autographs also have basic Refractor parallels numbered to 500. 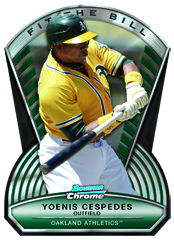 The 2013 Bowman Chrome Baseball base set has 240 cards, 190 veterans and 50 rookie cards. Arriving with a similar look are 110 Prospect inserts. These cards have a Refractor structure that's similar to the Chrome Autographs with a couple of exceptions. Basic Refractors are not numbered. Blue Refractors come numbered to 250 and Purple Refractors are numbered to 199. Gold, Orange, Red and Superfractors all come in the same quantities as autograph parallels. A total of 20 Prospects also have variation versions. Risin' Thru the Ranks is a mini chrome insert that spotlights one prospect from every organization. Emphasis is put on those who are fast-tracking their way to the majors. Autographed versions are numbered to 25. Some highly touted prospects live up to the hype. Others flop. Fit the Bill Die-Cut cards focus on veteran players who followed through on the high expectations placed on them. Basic versions are numbered to 99. Autographed Refractors are limited to 25 numbered copies. Carrying on from other 2013 Bowman-brand sets are Bowman Black Autographs (#/25) and 65th Anniversary Sapphire Refractors that spotlight some of the top Bowman rookie cards in the brand's history. Autographed versions are numbered to 5. 2013 Bowman Chrome Baseball is rounded out by redemptions for game-used All-Star Futures Game hats. These are exclusive to hobby boxes. Good: On-card autographs. Lots of colored Refractors. Affordable product. Bad: Difficult to hit big. Only one autograph per box. Most prospect cards take time to develop and gain value. 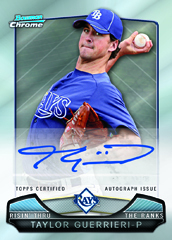 The Bottom Line: 2013 Bowman Chrome Baseball is one of the most anticipated products each year for prospect collectors. When players make it to the big leagues and become stars, their Bowman Chrome autographs are usually their most sought after cards. 2013 Bowman Chrome Baseball is especially attractive with the possibility of pulling a Yasiel Puig autograph. The card design is typical of past Bowman Chrome products with the plain white border. One slight improvement is that they have at least incorporated the team colors between the photo and border. The prospect photos are improved over years past where they were sloppily air brushed into their professional uniforms. Now most of them are either featured in their uniforms or the photos look much more realistic. I like the close-up shots of the players hitting or throwing the ball. I'm not a fan that the "1st Bowman Chrome Card" notation is missing. While I generally know who the first cards are of the top-tier prospects, it's tough keeping tabs on all of them. Like many collectors, one of my favorite aspects of Bowman Chrome are the rainbow of Refractors. I especially like the addition of the Blue Sapphire Rookie Reprint cards. I would love to see that be a parallel of the base chrome cards and not just the rookie reprints. I also like the Rising Through the Ranks mini cards that are inserted one per box. These seem to be a popular addition very similar to the Cream of the Crop mini Refractors that were featured in regular 2013 Bowman Baseball. As far as the prospects go, this particular run of Bowman Chrome leaves a lot to be desired. Unless you count Puig. That said, there is a very solid rookie class. One of the down sides of Bowman Chrome is that if you are a set collector, it will take a few boxes or some effort shopping around and trading to be able to complete the set. One thing collectors need to be on the lookout for are the Prospect Variation cards. Many collectors may have them and not even realize it as the differences are very subtle compared to those seen in recent Topps products. 2013 Bowman Chrome Baseball is affordable. The difficulty is that unless you pull a nice colored Refractor Autograph or Puig, the market is not high on most of the players right now. It is always interesting to see what happens to prices once one of the prospects featured makes an impact in the big leagues. Many times, this is a wait-and-see product where collectors have to sit on the cards and hope the players move up through the ranks. With only one autograph per box, the fun and suspense decreases greatly once it is pulled. I pulled the autograph in the second pack. The only hope left was for some nice color, which this box delivered. ANDREW KNAPP PHILLIES 2013 BOWMAN CHROME BLUE REFRACTOR #28 99! JI-MAN CHOI 2013 BOWMAN CHROME MINI ORANGE REFRACTOR #BCP9 MARINERS #4 15 MADE! Looks to be another Excellent year for bowman. But release date is too late in the year. Is this being released on 9/27 or 10/2? David � Bumped up release on 9/27. is this checklist complete? I pulled a ryan howard bowman first year card BDP138. its of him in a USA baseball jersey..? and a john smoltz reprint err something? also the risin thru the ranks minis have #d parallels. not sure how deep it goes but I pulled a blue one /250. 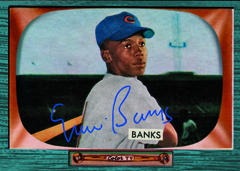 emeekins � This is the final checklist provide by Topps. If you look under the Blue Sapphire Reprint inserts, you will find both Smoltz and Howard. The only Rising through the Ranks parallels I have seen are the Blue Refractors #/250. whoops must’ve skimmed right past that section.. thanks! Flooded with 64 Autos most worthless and now the product is tanking 3 days into release . Thanks TOPPS! I pulled a gold refractor prospect card of Tyler Glasnow, but it is numbered /10 instead of /50 any idea what that’s about? ojcarrasco � There appears to be a yellowish Refractor that is numbered out of 10. It is a slightly different color than the gold Refractors, so it would be easy to miss if you did not check the numbering. eBay sellers are calling it a yellow or yellow gold parallel. Only a few have shown up online. Congrats on the pull. honestly nothing pisses me off more than an incomplete checklist. what’s the point? put out cards that no one knows about? all those “hidden” or “mystery” cards are thought to be fake. just put the goddamn checklist out for christsake. is that too hard? I take that back.. one thing gets on my nerves more than a bad checklist. it starts with an R and ends with -redemption. If I pull a prospect auto card, does that count towards the guaranteed auto in my box or should there be a second one with the prospect auto being a bonus auto in every third box? Chris � The sales material promised one autograph per box. Interesting that they’ve tagged the Yasiel Puig card as a “RC” and yet they’ve also included a prospect autograph card of him as well. Why is that? More marketability for his autos? Ron � Not sure. Could be the card was in the production pipeline before he got called up. Whatever the case, the biggest thing was to get a signature of some sort in there. 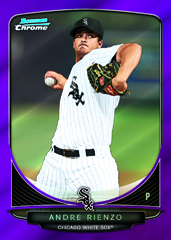 Bowman Chrome base cards (the 1 – 220 list) have X-fractors (possibly retail only? ), Green Refractors, Magenta (or pink) Refractors /35, and printing plates. Risin’ Thru The Ranks minis also have Black Refractors /10, (Canary) Yellow Refractors /10, Red Refractors /5, and Superfractors /1. Fit the Bill Die-Cut’s also come in X-Fractors /24 and Atomic Refractors /10. 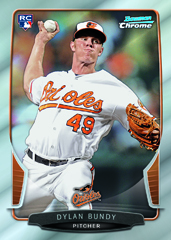 The Bowman Chrome Prospects have an X-Fractor too. Thanks! I look to your checklists all the time! Figured I’d mention what I could to give back a little! Bought 3 boxes and am very pleased. Pulled 3 Auto’s plus a redemption for a total of 4 Autos. One of which I thought was a regular EG Auto, well just realized it is the Gold Refractor of EG Auto worth $300 not $100. The card I get in the mail Is a blue parallel R Auto. I see nothing in Beckett about parallel, but I see the “blue”. Any ideas? Or was the parallel part just left out to save some ink? Overall very satisfied. I am so happy, hope one day to pass my cards on to my nephew. Just picked up my first 3 packs of this and got a Matt Reynolds Bowman Black series autograph 22/25. Is he even a decent player? I hate when companies put low end players in high end inserts. Should there be an ACR (Autographed Chrome Rookies?) list added to the checklist? I have a Tyler Skaggs Autographed Refractor #/500 ACR-TS, and I don’t see it on this checklist or the Topps website. chase � Scooter Gennett is #27 in 2013 Bowman Draft.